The goal - new route in alpine style on Manasly peak. 9 May, 2006 They're back in the Base Camp. SMS 11-00 a.m. (Moscow time): We're are back in BC. Thanks to all, who followed our climb. We congratulate all with this great day - May, 9 - Victory Day. 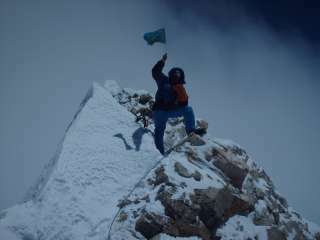 8 May 2006 Today evening Denis and Serguey summited Manaslu! SMS 6-00 p.m. (Moscow time):Summit at 6-30 p.m. We're safe and sound, set the tent at the plateau 7600. 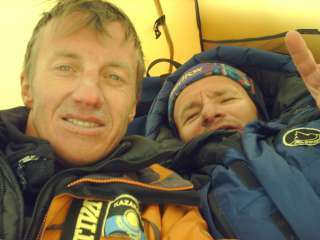 6 May, 2006 SMS 4-30 p.m. (Moscow time): We climbed till about 7250 m. Stoped in a safe place under the serak. We're very tired but fine. SMS 7-30 a.m. (Moscow time): We climbed till 6800 and are going to work further today. The weather's fine. Probably, there wouldn't connection today evening, don't worry. 5 May, 2006 SMS 0-30 p.m. and 4-50 p.m. (Moscow time): climbed till 6500. Very difficult snow conditions, the weather's extremely bad. "We work untill 3 p.m., then the bad weater begins and we fall from our legs. Greetings to the Russianclimb reders and TNF company. 4 May, 2006 SMS 11-00 a.m. (Moscow time): We climbed till 6000. The camp place is safe. The slope is as better as higher. Tomorrow we're going to reach 7000 m. There we'll be closed by the Mountain, so there would'not connection with you or the Base Camp. All's OK". 2 May, 2006 SMS 3-00 p.m. (Moscow time): We're in the Base Camp again. Want to climb Manaslu again. Probably, we'll start in Thirsday. We're tired but sure in our success. 29 April, 2006 SMS 6-00 a.m. (Moscow time): We rested in the Base Camp and today will go down to Samagaon. 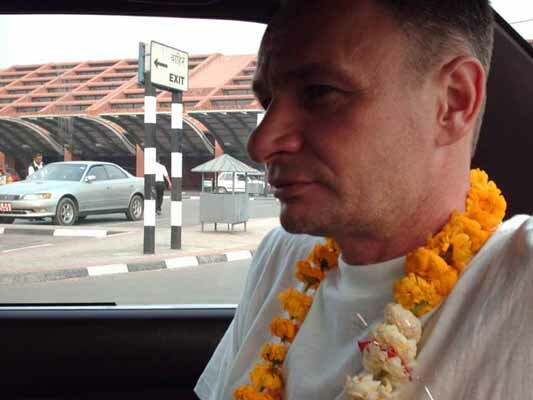 April, 27 2006 Denis Urubko: we'll rest 5-6 days, and then will try to climb Manaslu one more time. April, 25 2006 SMS 14-50 (Moscow time): We summited at 11-45 a.m. (Nepal time). Back to the tent at 7450 we descended a hour ago. April, 24 2006 SMS 1-50 p.m.: We're at 7450m! Heading to the summit - we'll decide looking to the night weather. 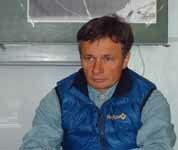 Climbers needed the weather forecast - Alexander Chechulin from Almaty wrote to Russianclimb about it. So, I immediately wrote to Italy to Barbara Zwerger (Simone Moro's wife) and asked her to help with it. Barbara called to Carl Gabl in Insbruck - he usually help Simone with the forecasts). Carl's so kind - he returned to his office, recorded the forecast and sent it to Barbara, then she forwarded it to me. That's a good example of international cooperation! Thanks to all! Barbara wrote: Carl Gabl everytime did perfect forecasts for Simone, so Denis can trust 100%. also some snow, but he can not say how much. Than it will became worse, because of more cumulus. April, 23 2006 SMS 13-30 (Moscow time): Gretings! We reached 7000. We've tired as much as could - such hard work is not good for the duo. We'll rest - and then decide if go tomorrow - to the BC or to 7500. The weather's good enough, and we've food and gas. April, 22 2006 SMS 12-30 (Moscow time): We're ahead again - why? what for? WE have found the good way, but there's no good place for the camp - avalanche danger slope. We've caught snow at 6400. No visibility. SEt our tent between two crevasses. Horhe and Peter helped us, but then descended to Camp 1. April, 21 2006 SMS 3-30 p.m. (Moscow time) : We reached C1. THe weather's fine, but avalanche danger is high. Tomorrow we'll try to climb till C2. Greetings! April, 19 2006 SMS 12-30 (Moscow time): We're very slow, but accrding to the plan. Tomorrow we'll third time go to C1, and will try to climb further. April, 16 , 2006 Denis Urubko, SMS 11-20 (Moscow time): We're not Serguey and Den - we're BADJO and DAY. On Nepalese it means "Father" and "brother". Inaki learned "to work today" om RUssian. They climbed 500 m couloir above C1. The weather's extremely bad. April, 14 , 2006 Denis Urubko, SMS 12-50 (Moscow time): We descended to BC. The way to C1 is acceptable, pity that it's covered by snow again and again. We're waiting the weather. All are ready to go up, but I and Samoilov will rest. 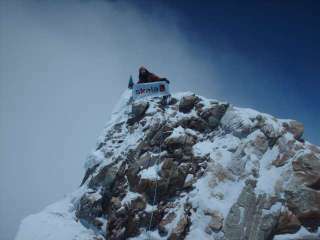 April, 12 , 2006 SMS from Urubko (1-50 p.m Moscow time): I and Serguey Samoilov managed to reach C1 at 5700 m. We're extremely tired! Huge amounts of snow! The route, as it is, begins from this point. THe weather's very-very bad, but SErguey took salt fish with him, so we eat it and drink tea. Greetings to all! April, 10, 2006 Manaslu Base Camp. 00-06 p.m. (Moscow time) SMS from Urubko: Our today push was burried by half - a - meter snow layer, visibility 30 m only. I play poker with Russian- Georgian alliance. My training here - fast running up on 50-m trail to the hill top near BC - 10 times per day. The weather's very bad, we clean our tents from the now again and again. My tel number is +8821671101941. 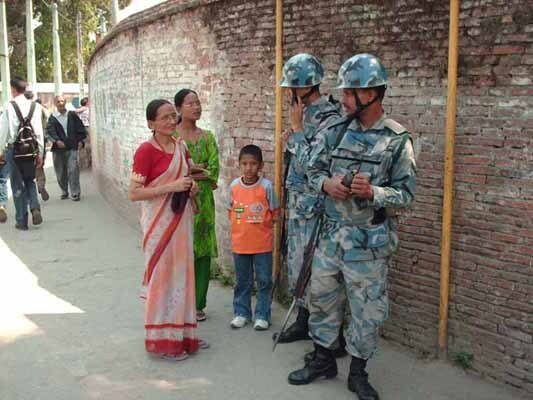 When we are in BC, everybody can call us from 4 till 5 p.m. (Nepal time). We'll be glad to hear you! April, 8 Denis Urubko called at 5 p.m. (Moscow time): We are all here - me, Serguey, Serguey Bogomolov, Gia, Inaki and Peter. Greetings from all! We share BC. All are OK, but it's very cold! - there's Inaki - he's cold in his down suit! Here's only 4700, but it's colder than usually at 5000. It's snowing hard. I and Serguey Samoilov will climb normal route with guys, and after it we'll try another route from the other side of Manaslu. Our greetings to Boris Korshunov - we're belive in him! And in all their team! Simone stayed the boots for Korshunov in Cho Oyu Trekking office in Kathmandu. April, 7 Denis Urubko, SMS: We arrived to the Base Camp at 4700 m. All are OK, but I'm sick after our cook's dinner. We're first here in this season. There's no too much snow, and Inaki worked first on the trail - he hasn't alowded anybody to help him. Greetings to all! April, 5 We're in time to left Kathmandu! Today we're flying to Samagaon. 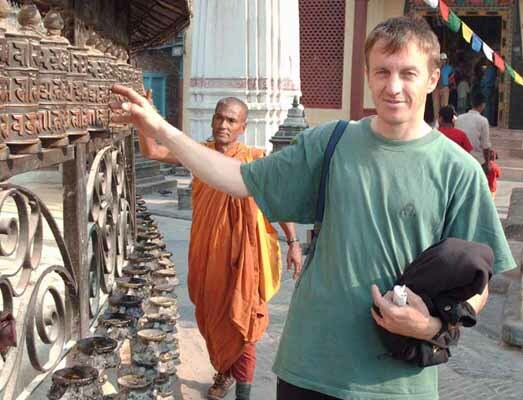 Denis wrote from Kathmandu: Hi! We are solving all organizing problems here, buy food and other things. Samoilov has bought the very strange pants - locals are seing to him with great interest.. Here's quite - very few tourists in Tamel, all prices are decreased compared to 2000. We'll start on April, 5 to Samagaon by heli, so, we'll reach base camp April, 7. Bogomolov and Gia Tortladze will ariive tomorrow. As say Inaki Ochoa and Peter (our expedition members)- all of them are obliged to speak Russian by the expedition end. At the first lesson (I was a teacher) Inaki learned the phrase "I'm not a crazy" on Russian. Tomorrow I'll check if he remembers it still. Good bye! - Winter Almaty mountaineering Championship. 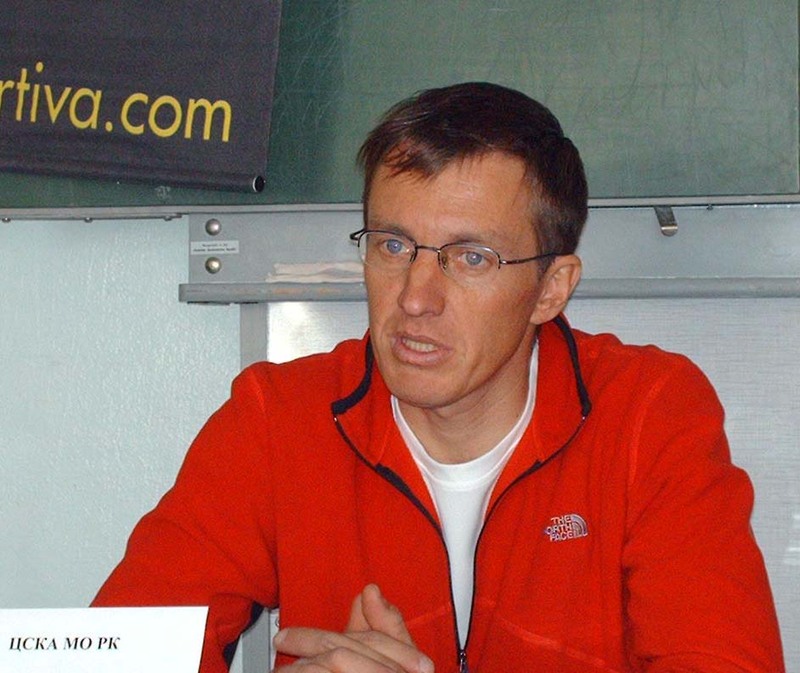 Urubko was a member of the team, which became the Winner. Samoilov - the coach. - Mramornaya Stena winter climb, 5a, alpine style, extremely fast. Urubko, Samoilov were members of the team. - Spring Rock Championship of Almaty. Urubko was 4th in multi cups, and 1st in rock climbing party races.